Nebraska has been particularly hard hit. 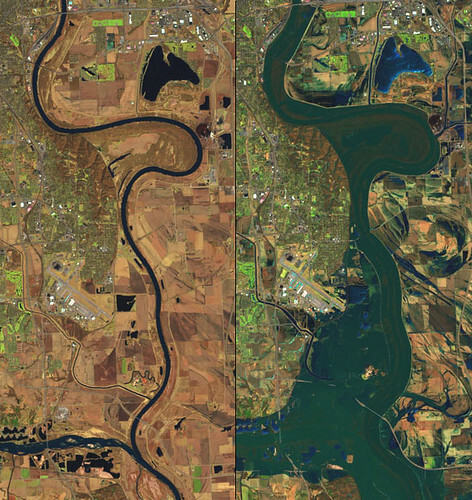 On March 16, 2019, the Operational Land Imager (OLI) on Landsat 8 captured a false-color image that underscores the extent of the flooding on the Platte, Missouri, and Elkhorn Rivers. For comparison, the image on the right shows the same area in March 2018. Several communities west of Omaha (between the Elkhorn and Platte Rivers) either flooded or temporarily became islands as floodwaters encroached from both sides. One-third of Offutt Air Force Base was inundated and 30 buildings were damaged, according to news reports. Rising flood waters forced people in dozens of communities to evacuate.